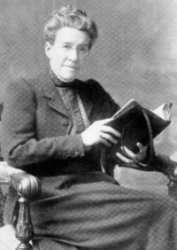 Jessie Penn-Lewis (1861–1927) was a Welsh evangelical speaker and author of a number of Christian evangelical works. Penn-Lewis was born in Victoria Terrace, Neath in 1861. Her father was an engineer and her grandfather a Calvinist Methodist minister. She was married to William Penn-Lewis. She was involved in the 1904–1905 Welsh Revival, one of the largest Christian revivals ever to break out, although the revival was abruptly shortened with the mental and physical collapse of one of the leaders, Evan Roberts. Penn-Lewis traveled internationally to take her message to audiences in Russia, Scandinavia, Canada, the U.S., and India. Penn-Lewis was close to Evan Roberts and there is some controversy associated with her influence over him. After the breakdown by Roberts cut the revival short, he stayed with the Penn-Lewises for a couple of years, but never fully recovered. Ultimately, Penn-Lewis declared some of phenomena of the Welsh Revival to be the work of Satan, declaring her still controversial position in her book on spiritual warfare called War on the Saints, which describes the work of demons on Christians, the theme for which Penn-Lewis is most known. Penn-Lewis was influenced by the Dutch Reformed, South African writer Andrew Murray among others, and her books contain quotes from him and references to his works. Frank Buchman, the founder of the Oxford Group, credits Penn-Lewis with helping him to turn his life around from depression when he heard her speak at a Keswick Convention. She also influenced Johan Oscar Smith, the founder of Brunstad Christian Church and the missionary statesman Norman Grubb. "The Magna Charta of Woman"
She founded the magazine The Overcomer, which is still published. ↑ Haddad, M. R. (2005): The Mystical theology of Jessie Penn-Lewis (1861-1927), Durham Thesis, Durham University, p. 83. Available at Durham E-Theses Online: http://etheses.dur.ac.uk/2708. ↑ Fisher, G. Richard (2000). "Pressing Truth to the Extreme: The Errors of Jessie Penn-Lewis". Personal Freedom Outreach. Retrieved 2007-06-16. ↑ Garrard, Mary (2014). Mrs. Penn-Lewis: A Memoir. Shoals, Indiana: Kingsley Press. ISBN 9781937428457. ↑ Selby, Saul (15 September 2000). Twelve Step Christianity: The Christian Roots & Application of the Twelve Steps. Hazelden. p. 208. ISBN 1-56838-561-7. ↑ Lie, Gier (2004). "The Christology Among Smith's Friends: A Misunderstood Impulse from the Keswick Tradition?" (PDF). Asian Journal of Pentecostal Studies. 7 (2): 305. Retrieved 13 July 2010.